Things opened up with a dreadfully boring 12-rounder (which I believe Michael Buffer announced as a ten round fight) between Mike Perez and Bryant Jennings—a close fight in which referee Harvey Dock took away a point in the last round enabling Jennings to win. The judges were split, scoring the bout 114-113 Perez, 114-113 Jennings and 115-112 Jennings. Dock has done good work, but to quote Harold Lederman, this was “atrocious.” Had the “infraction” been a serious one, I can understand Dock’s call, but it wasn’t serious as Perez’s punch was already in motion just as Harvey said “break.” And no amount of defending the call by Steve Weisfeld or the overbearing Max Kellerman changes that, speaking of which, does Steve ever disagree with a Referee’s call? The fight should have been a draw. At any rate, Wlad Klitschko has little to worry about insofar as Jennings is concerned. Some buffoonery occurred in the first round of the GGG-Geale fight which actually went 4 minutes. Was the time keeper mesmerized by Golovkin’s skills or did he or she just fall asleep. Geale then tripped over a cameraman’s gear that was too far into the ring. Someone needs to be banned for that kind of mishap. Finally, Golovkin (now 30-0) scored a knockdown early in the second and then late in the third round (the 2.47 mark), he put an abrupt end to the nonsense when he exchanged rights with the “Real Deal” and Geale went down like he had been sapped. When he got up, he moved backwards and said he was done. Another short night of boxing for the Kazakhstan bomber who went on the stalk early, opened a cut with his punishing jabs, and finally caught his prey. 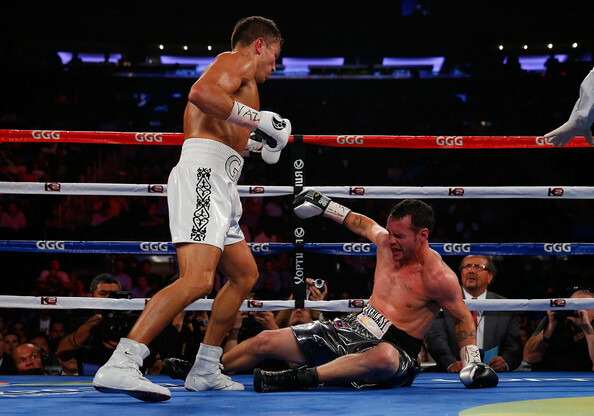 The knockout was Golovkin’s 17th in a row. Golovkin has the highest knockout ratio of any active world champion (90%) with a record of 30-0-0 (27KO’s). In the end, he gave the fans exactly what they wanted and then called out Miguel Cotto as his next desired opponent.